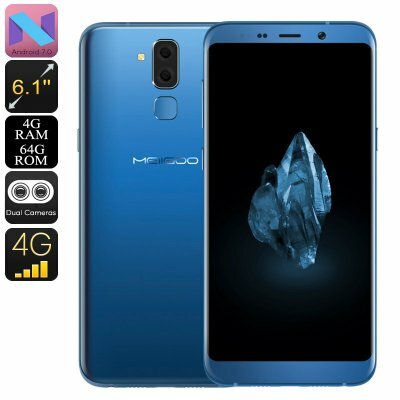 Successfully Added Meiigoo S8 Android Phone - Android 7.0, Dual-IMEI, Octa-Core CPU, 4GB RAM, 13mp Camera, 6.1-Inch Full-HD, 4G (Blue) to your Shopping Cart. Arguably one of the best cheap Android phones available, the Meiigoo S8 smartphone treats you to the latest features and high-end specs at an affordable price. This Android smartphone runs on the Android 7.0 operating system. Thanks to this, you’ll be able to undergo a smooth and lag-free user experience while enjoying all the Apps and media of your liking. With free access to the Play Store, this cell phone treats you to millions of the latest movies, games, and Apps that can all be installed in the blink of an eye. It features a 3300mAh battery for hours’ worth of usage time – ensuring that you’ll never have to feel bored during the day again. This cheap Android phone features an absolutely stunning 6.1-Inch display. With its Full-HD resolution, it brings forth crisp 1080p visuals that let you enjoy your favorite films and series like never before. Underneath its screen lays hidden a powerful Octa-Core processor and 4GB RAM. This hardware allows you to tackle the latest and most demanding software features without dropping a frame. Additionally, your smartphone has 2 IMEI numbers and supports 4G. This brings along great connectivity and makes sure you’ll always stay connected no matter where you’re at. The Meiigoo S8 Android phone holds plenty of storage with its 64GB ROM. For the real excessive smartphone users among us, the Android phone allows you to increase its memory by inserting a 256GB SD card. Thanks to this, it becomes nearly impossible to run out of storage for your files, media, and pictures. Photos and video can be snapped yourself with the cell phone’s professional-grade 13MP Dual-Rear camera. This snapper lets you shoot breathtaking pictures and film at any given moment – surely bringing your mobile photography capabilities to the next level. The Meiigoo S8 Android phone comes with a 12 months warranty, brought to you by the leader in electronic devices as well as wholesale smartphones..